But he backed his players to come out the other side. Burnley suffered a fourth-successive Premier League defeat - the club’s equal worst run in the competition, after May 2015 when they were relegated - at Wolves. Raul Jiminez’s second half strike proved enough, but the hosts could and should have won by more, to leave the Clarets with only a point to their name. 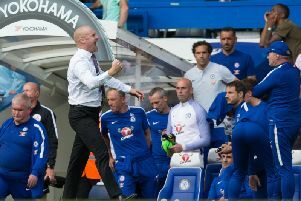 Dyche said: “I thought they were the better side overall, definitely on the creative side of the game, the positive for us was we look much more like us defensively, in the sense of blocks - the keeper played great, but in front of that, blocks, energy to block, willingness and desire. “But that’s the only thing I can pick out. Offensively we gave the ball away so many times in so many cheap positions, and you can’t do that. “But credit to them, they’re a good side, they’ve invested very well over the last couple of years, and you can see it. “I think that’s the fifth time the same side has played together - ironic that, I’ve not been allowed to. “They’re a good side, good connections, they know their roles and responsibilities, but I thought they were very good. “And sometimes you have to give credit to the opposition. “But we’ve got a bit of a fog around us at the moment, brought on by many different things. Burnley’s success under Dyche has come from consistency of selection, but there were three changes again at Molineux, and Dyche explained: “It’s been tough, we had to (rotate), I’ve got no other thoughts than we had to do that with the travelling, all the Europa challenges - mainly the travelling, and the recovery. “But the team, more or less, know their roles. They definitely know, but the team connection today - this team, or a version of it, has played together enough times, particularly offensively, to play better than that. “But the players have been terrific in the last two weeks, training, the feel, the desire, but it’s important when that whistle blows, that’s the key to it. And he feels a disappointing transfer window, injuries to Steven Defour and Robbie Brady, and the added complication of Europe have taken their toll: “I think there’s a lot of small things add up to a big thing. “Immediately, after finishing seventh, it’s ‘ooh, Europa now, lots of games’, negative from the off. “That doesn’t lose or win a game, but it builds and builds, get off to a tough start and it builds some more, etc etc. “These players now are different to me and yourself, they have a bombardment of messages from social media and it can get ground into you, and you lose sight of the fact it’s a great accolade to get there, and to perform there. Burnley didn’t create much in the way of chances, but saw a late volley from Matej Vydra deflected just wide, and Dyche added: “There weren’t too many positives, but Burnley-like in the sense we keep in there, and you never know. The crowd you could sense getting a bit edgy, but you need to be offensively better than we were. “And we have been many times, even when we’ve defended well and been structured. We’ve always caused teams problems, and we didn’t cause enough today.